You'll be joining in on another heist in this adventurous game. Click here to play! This time you'll be looking to nab millions in priceless art with Remy and Raoul. Pull off this job and you'll bring in plenty of cash! You'll have to advance through the different stages of the plan and complete a task in order to win. Spin four to five of the masterpieces in order to advance through each stage. Watch out for the Forger as you proceed. He's a wild symbol. Spin two to five of these cons and you'll get up to 5000 coins. He will also replace almost all other symbols to help create more wins and will double prizes if he appears in a winning combination. To help you in your quest for cash, there are plenty of other paintings, including renditions of Remy and Raoul. Spin three or more to bring in big wins. There are a couple of different bonus games in this slot, including the Robin Hood bonus round that can be triggered at any time. You can also trigger a bonus round by spinning three or more Reel Crime logos. It's even more chances to win big money. Help Remy and Raoul through their plan to steal many famous masterpieces. If you're successful you'll bring in plenty of money! The four different masterpices act as a scatter. These are pretty important because if you spin four or more, you will advance your game. The Forger also acts as a scatter in selected rounds, triggering free spins if you get three or more on the board. The Forger is a wild symbol. Spin two to five and you will get up to 5000 coins. He will replace most other symbols (excluding scatters and bonuses) to create more wins. If he appears in a winning combination, he will double the prize. 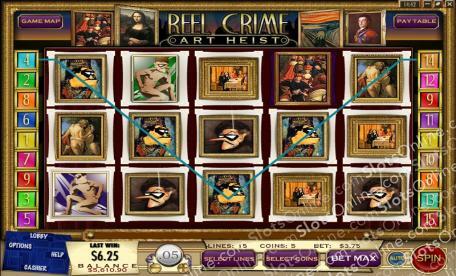 There are a few different bonus games in Reel Heist. The first is triggered when you spin three or more Reel Heist logos anywhere on the board. During this game, you will need to pick from a selection of boxes to find a masterpiece. You'll be on a budget though, so don't pick too many fakes. Any money leftover at the end of the round will be credited to yoru account. There is also the Robin Hood bonus round that will be triggered randomly. In order to play this game, you must bet max coins and max lines.